New York City (October 7, 2015) – In a highly anticipated showdown between Brooklyn’s most exciting and talented fighters, WBA Middleweight World Champion Daniel “The Miracle Man” Jacobs (30-1, 27 KOs) will take on former world champion Peter “Kid Chocolate” Quillin (32-0-1, 23 KOs) on Saturday, December 5 from the Barclays Center in Brooklyn, New York live on Showtime (9 PM EST). 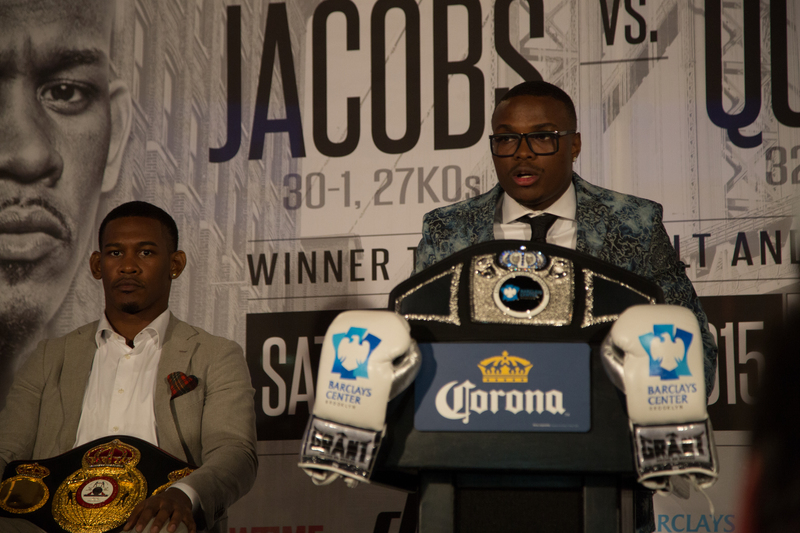 The Jacobs vs Quillin press conference, which took place on Wednesday, October 7 in what appeared to be a media packed Planet Hollywood in Times Square, featured both fighters rocking custom suits showing that Brooklyn’s “mega fight” is nothing more than business as usual. The fight, now dubbed as the “Battle for Brooklyn” features two homegrown fighters looking to not only retain/capture the WBA Middleweight World Championship belt, but the newly created Brooklyn Championship belt that one of the fighters will get to proudly take home as well. The press conference was led by Lou DiBella who exclaimed that the winner of “This belt will determine who is the man of Brooklyn,” while holding the newly crafted belt. DiBella also joked around with both fighters, pointing out Quillin’s wild, custom jacket by saying “Peter has the fancier jacket, but Daniel has the belt.” DiBella then went on to say how this fight may not be as big of a slug fest as some “experts” may suggest; but rather a skilled battle due to the magnitude of this fight, and what is at stake. After DiBella’s opening comments, Quillin was up first to speak to the media. A well-dressed Quillin gave thanks to all of his team, as well as pointing out the tough competitor that Jacobs is, and how truly difficult this fight will be. 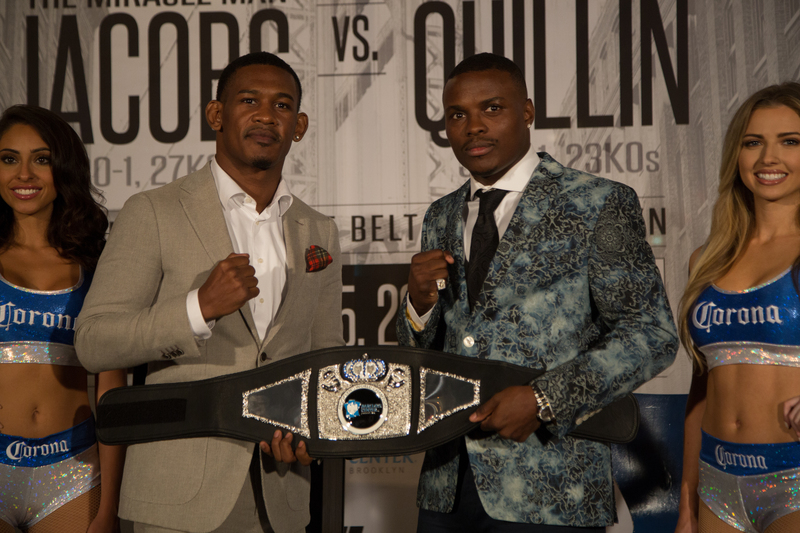 “I’m thankful to be apart of a historical event” Quillin stated in reference to the magnitude of this Brooklyn battle. Quillin then pointed out his original concern for the promotion of this fight since he has recently been dubbed as the “bad guy” by the media, but said he wasn’t the guy everyone perceived. “I was worried this fight would be billed as the good guy vs the bad guy; but this fight is really the good guy vs the good guy, and it’s good for the sport of boxing” Quillin said while looking at Jacobs. Overall, a confident Peter Quillin left an impression on the media as he thanked his team, showed his respect for Jacobs, and his excitement for what was on the horizon for December 5th. After a confident Peter Quillin, Daniel Jacobs took the podium to give thanks to his team, and everyone who was apart of making this fight happen. “This is a big opportunity for me, this is a big opportunity for Brooklyn” Jacobs said to the media. “I’ve been calling Peter out for a long time, 2 years now,” Jacobs jokingly said while looking at Quillin. “I believe my time is now. With all that I’ve went through outside & inside of the ring. I’m at my prime” a confident Jacobs stated. Jacobs gave the media an idea of how serious he is for this fight, telling everyone he had a pre-training camp to his training camp that is running 10 weeks because of how serious this fight is to him, and how he isn’t taking this match-up lightly at all. After his confident comments, Jacobs found a way to give a small jab to “Kid Chocolate” by saying “I haven’t been eating chocolate due to camp, but come December 5th, I will be the cookie monster” a laughing Jacobs said to Quillin. This “Battle for Brooklyn” has officially been hyped up more than some fans could imagine. Both fighters are confident, and ready to take the main stage for what could end up being labeled one of the most epic fights of the year!